Good morning! Today I am playing catch up. I have several cards I didn’t get around to sharing from 2018. Some I will post later but here’s a quick share of a few with a bit of info on each. My first card uses the beautiful Altenew Layered Rose die that was a free sample in a Simply Cards & Papercraft magazine a while back. The thanks die is by Echo Park and the Wonky Stitched Ovals die is by Gina Marie. The colors of cardstock I used are black, SU! Coastal Cabana, Pink Pirouette, Melon Mambo, Raspberry Ripple, Pear Pizzazz, and Mossy Meadow. My next card uses the SU! Bird Banter stamp set and the sentiment is from Altenew’s Label Love. 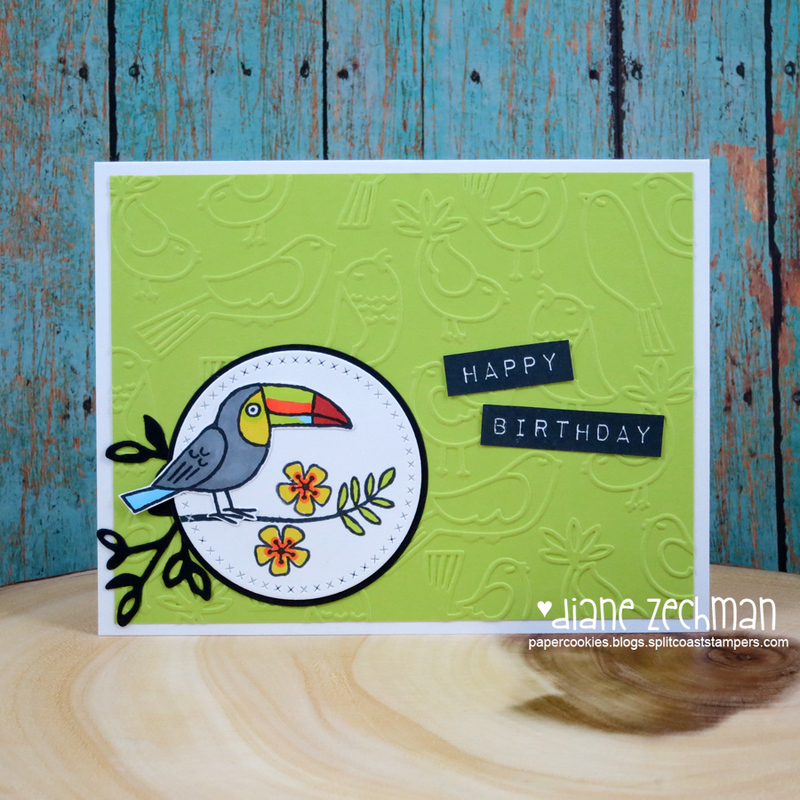 The Paper Studio’s Poteeka Birds embossing folder goes great with this set and I love it in the Lemon Lime Twist cardstock. A little black branch was added from the SU! Petals & More Thinlits. 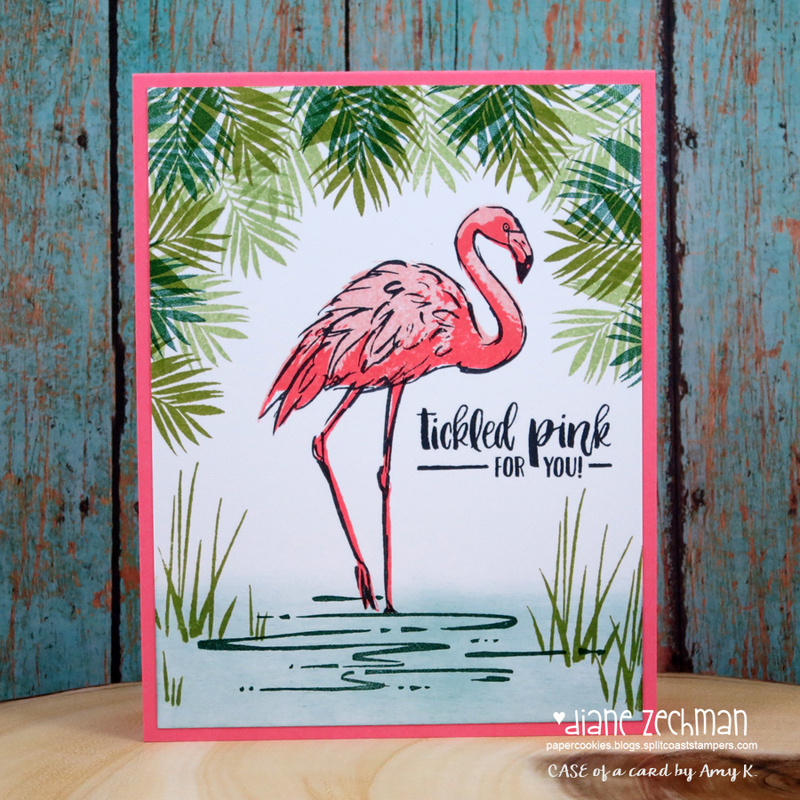 This fun flamingo one is a CASE of a card by Amy Koenders using the SU! Fabulous Flamingo set…love it! It uses Flirty Flamingo ink and cardstock of course! Here’s another card with the Flirty Flamingo ink and cardstock, along with some gold paper and a gold strip of washi tape. This could be for any occasion but it was a congratulations on an engagement card. Stamps are from the SU! July 2016 Paper Pumpkin kit- What a Gem. The butterfly card was inspired by the talented Kittie Caracciolo. I used SU!’s Watercolor Wings stamp set and Bold Butterfly Framelits. 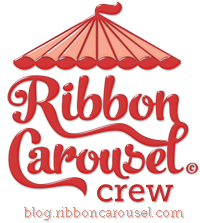 The dies are Simon Says Stamp’s Stitched Circles and Spellbinders Picot Edge Circles. I also used the Martha Stewart Frond and Hydrangea punches. 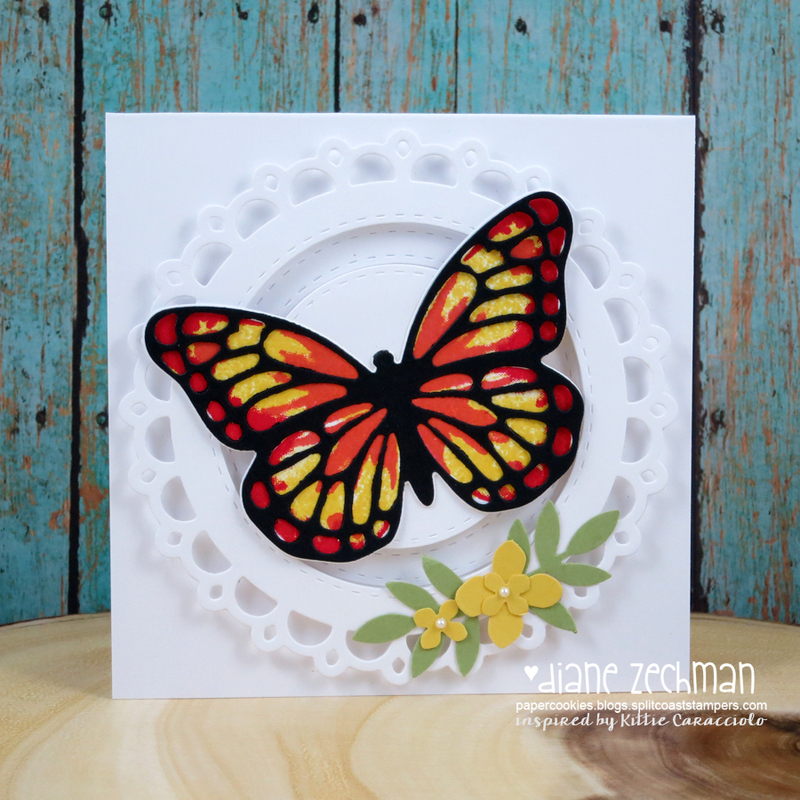 The butterfly was stamped with Daffodil Delight, Calypso Coral, and Real Red inks. 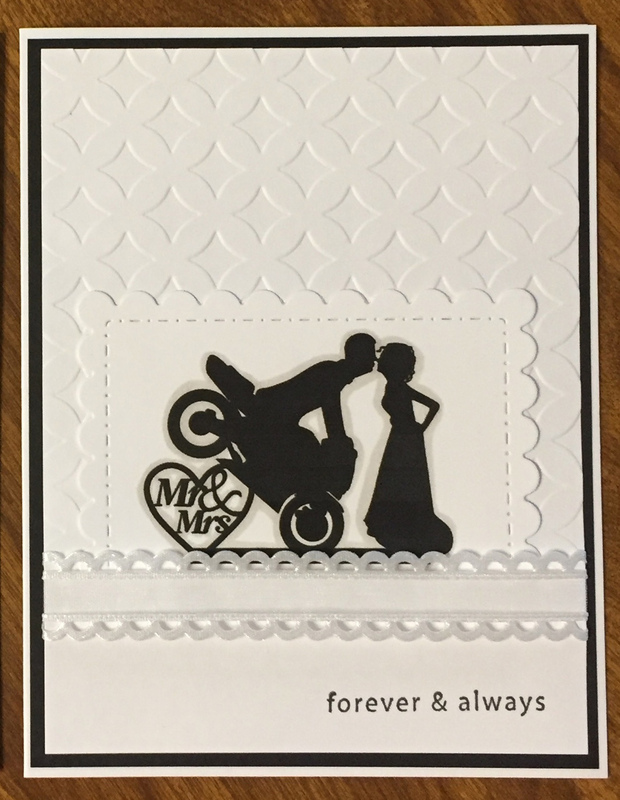 My daughter was attending a wedding of some motorcycle enthusiasts and asked me to make her a card. 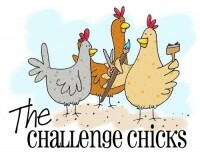 This was a clip art image I found online and I just added a simple stamped sentiment. 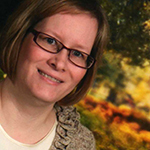 And my last card is a CAS sympathy card…not a bright card this time but rather done in softer colors. I used a Park Lane Tree embossing folder and Martha Stewart Royal Butterfly punch. The sentiment is from SU! Love & Sympathy. Thanks for popping in….have a great day! 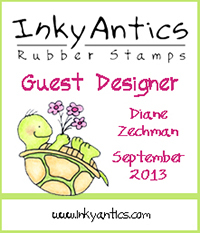 This entry was posted in Altenew, cards, etc., CAS (clean & simple), Stampin' Up!. Bookmark the permalink.